Over the past few months, one of the trending email topics is re-purposed and recycle clothes. 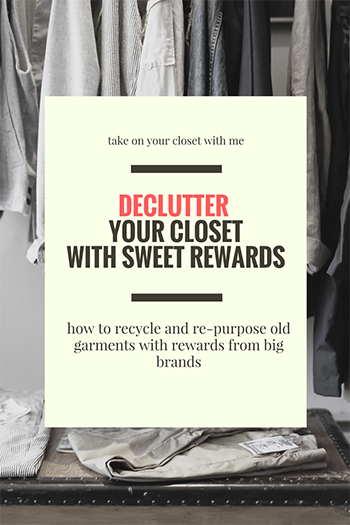 Inspired by contents from The North Face, Patagonia and more, here are ways you can declutter your closet by re-purposing and recycling clothes with sweet rewards. Leave your email inbox for something more important. Follow newsletters like how you follow Twitter feeds at Groota. reward: REI sell them for you (shop used gears here), but how much do you get from the sale is unknown. reward: for every bag you drop off, you will receive a discount card for 15% off for next in-store purchase. They often remind their customers about this recycling program in the marketing emails. They are very serious about this. reward: depends on the retailer. For 2018 program, Frame, J. Crew, True Religiou and Madewell partners with Blue Jeans Go Green. They offer various rewards. Blue Jeans Go Green regularly release news on new participating retailers in the newsletter. Sign up with their newsletter to get the news on latest participating retailers. There are other recycling programs offer by retailers. Here is the post that lists some of the cool ones.